This tip will discuss how to erase the Studio Artist 4 canvas. You can use the Eraser button located in the main operation toolbar (as shown above), or you can use the appropriate Canvas : Erase menu command. We will also discuss the differences between the old erase to background controls in previous versions of Studio Artist and the new erase controls. If you are interested in setting the canvas to the source image, you can jump to reading the last section at the very bottom of this tip which discusses the different ways to do this. Clicking the Eraser button with the mouse or pen will erase the current canvas layer to a selectable ‘erase to’ fill. If you mouse down on the Eraser button and then wait a few seconds a popup menu will appear below the eraser button that lets you select one of the different ‘erase to’ options. For example, you can choose to erase to fixed colored background like white, black or the current source color. 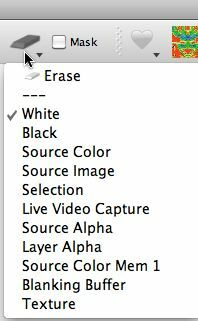 You can also choose to erase to the source image, the current region selection, the source alpha channel, a live video capture from your computer’s built in iSight camera, etc. Whenever you choose a new ‘erase to’ option, the canvas is erased to the option you selected. After that, just pressing theEraser button will erase to the option you previously selected. Shift clicking the Eraser button implements a full erase. We will discuss what this means below. All of the canvas erase functionality available in the Eraser button in the main operation toolbar is also available via menu commands in the main Canvas menu. Selecting the Canvas : Erase menu command erases to your current ‘erase to’ option. Using this menu is equivalent to pressing the Eraser button in the main operation toolbar. Running any of the Canvas : Erase to menu commands lets you change your ‘erase to’ option and will also erase to whatever you select at that time. 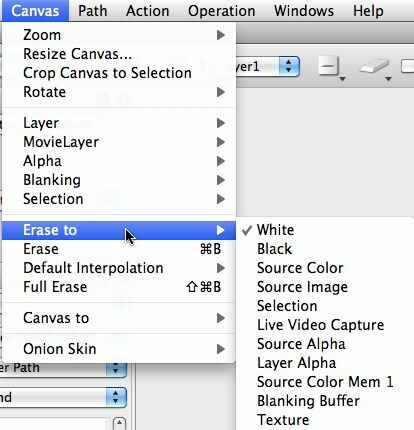 You current ‘erase to’ option will be checked in the set of Canvas : Erase to menu list. Note that the Canvas : Erase menu command is associated with a b menu command key. So you can use the menu command key shortcut instead of having to use the mouse to run the actual menu. This is a useful shortcut when working. On the mac for example you would press the command and b keys to run the erase menu command. The Canvas : Full Erase menu command does a few additional things in addition to just erasing the canvas to your current ‘erase to’ option. A full erase also erases the contents of the bezier path memory associated with the current layer. The Blanking Buffer ( a hidden frame buffer used by the paint synthesizer) is also erased when you do a full erase. And the alpha channel associated with the current layer is also set to full off when you do a full erase. The normal erase command only erases the contents of the RGB frame buffer channels for the current layer. The mechanics of erasing are slightly different in verision 4 as compared to previous versions of Studio Artist. The screen shot above shows the canvas erase controls in previous versions of Studio Artist, which were located at the top right corner of the main canvas. The popup located there let you choose a default background. So this is the equivalent of the ‘erase to’ options available in Studio Artist 4. The first button to the left of the old background popup with the solid arrow in it erased the current layer to the current background setting. So this button is the equivalent of the new Eraser button in Studio Artist 4. The second button to the left of the old background popup (with the circle in it) was the old full erase button. So this button is the equivalent of shift clicking the Eraser button in Studio Artist 4, or running the Canvas : Full Erase menu command in Studio Artist 4. There were a few background options available in previous versions of Studio Artist that are missing as ‘erase to‘ options in Studio Artist 4. We did this because they were really more like processing effects and could be implemented in other ways in Studio Artist 4. There’s a preset favorites category called ‘Old 3.5 Background Effects‘ (as shown in the screen snap above) that provides access to the old background options missing in Studio Artist 4. You can just select one of these background effect presets, and the press the Action button to set the current layer to one of these old background options. A common getting started question for new Studio Artist suers is how do i set the canvas to the source image. After reading the information above about how to erase the canvas, it should be obvious that all you have to do is hold the mouse down on the Eraser button for a few seconds until the ‘erase to‘ menu pops up, and then select the Source Image option in that popup menu. Or you can use the Canvas : Erase to : Source Image menu command. There is another fast and easy shortcut way to set the current canvas layer to the source image. If you mouse down in the small source preview image in the Source palette, you can then drag and drop it directly onto the canvas. This is the equivalent of erasing the canvas to the source image. Here’s another introducgtory tip on erasing the canvas.